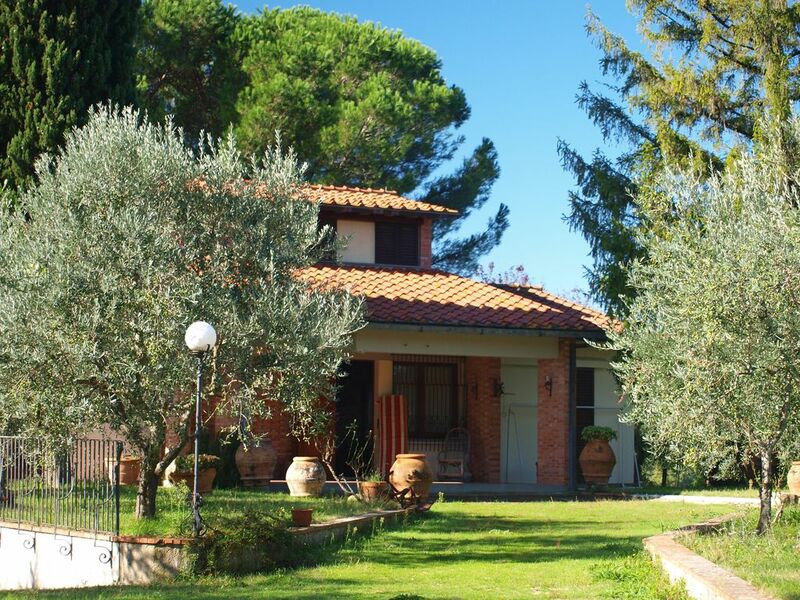 Just 20km from Florence, near San Casciano Val di Pesa, the property is located in a panoramic position, surrounded by the greenery of its large park with extensive olive grove. You can enjoy a wonderful holiday of wellness and relaxation thanks to its private position with exclusive access. Villa Andrei is a modern building that maintains all the Tuscan architectural tradition, offers two large loggias ideal for outdoor dining and dinners, it is equipped with a barbeque and wood oven. The garden at the back of the house, in the shade of five large pine trees, offers sweeping views with breathtaking sunsets. Inside a lounge with a large stone fireplace and dining room, on the left wing 2 rooms with shared bathroom, on the right wing a double bedroom with bathroom and kitchen. on the upper floor there is a beautiful billiard room with a double sofa bed. The house offers wi-fi and TV with digital terrestrial. There is ample opportunity for hiking and mountain biking in the woods surrounding the property. Located about 20km from Florence, 50 km from Siena and 100km from Pisa, it is strategically located for your visits to the Tuscan cities of art; located in the Chianti Classico area, near the residence, the cellars of the most important Chianti wine producers. Also nearby are many villages such as Greve in Chianti, San Casciano, Monte Riggioni, San Gimignano, Radda in Chianti and others. Only 20 km from Florence, near San Casciano Val di Pesa, the property is located in a panoramic position, surrounded by olive grove. You can enjoy a wonderful holiday with exclusive access. Villa Andrei is a modern building that retains all the architectural tradition of Tuscany. It offers two spacious lodges ideal for dinners and lunches outdoors. Views with breathtaking sunsets. Double bedroom with bathroom and kitchen, on the right wing. upstairs a beautiful bedroom with a double sofa bed. The House offers free wi-fi and TV with satellite channels. Wide possibilities for hiking and mountain biking. Located about 20 kilometers from Florence, 50 km from Siena and 100 km from Pisa, it is ideally placed for excursions to artistic cities of Tuscany. located in the Chianti Classico area, close to the residence, the cellars of the most important wineries of Chianti. Also nearby are many villages like Greve in Chianti, San Casciano, Monte Riggioni, San Gimignano, Radda in Chianti and others. Just returned from a fantastic week at Villa Andrei. Wonderful views, beautiful sunsets and a very comfortable home. Plenty of sunny areas and plenty of places to escape the sun. Loved every moment there. I want to live in Villa Andrei permanently. This is pretty much the best holiday home I have ever stayed at. What strikes you first when you arrive is the amazing location, perched on the top of a hill. Frankly, you could spend two weeks just walking around the grounds looking at the view of vineyards, olive groves and Tuscan landscape. We stayed during a heatwave so spent most of the time outside on the many verandahs and patios, where we ate, sampled the local drink, snoozed, read, played games, watched lizards catching flies, and just looked at the view, especially the incredible sunsets. The villa is well equipped with everything a modern family requires - in our case, with sons aged from 15-20, fast and reliable wi-fi, table tennis and a pool table kept them happy. I couldn't resist making pizza on the table outside the kitchen door, ready for my husband to cook in the wood-fired pizza oven. I now want one for my garden, but sadly the weather in England probably doesn't justify it! There are so many wonderful places to visit nearby (within 60-90 minutes' drive). There's the biggies: Florence, Siena, Pisa, Lucca. But also San Gimignano, and a tour of Chianti villages including Castellina in Chianti, Volpaia, Greve in Chianti and Montefioralle. Rita and Edoardo answered any queries we had very promptly and were very friendly and welcoming. We, very reluctantly, came back home and immediately starting talking about booking again for next year. It was such a fantastic base for a holiday. You know when you sometimes get back from holiday and within a week of being back at work it seems like a distant memory? It was the complete opposite of this after our fortnight at Villa Andrei, we keep on reliving the wonderful heat, the steady chatter of cicadas, the smell of olive groves and vines, the comfort and relaxation of being on holiday in Villa Andrei. I want to go back. I want to live in Chianti! Villa Andrei är ett perfekt hus för rekreation och utflykter i omgivningarna. Närheten till Florens, Sienna och andra sevärdheter som Volterra, SAN Gimingiano och cresaldo är fina dagsutflykter med bil. Huset är väldigt trivsamt med fantastisk veranda att äta middag på där man kan njuta av den Toscanska solnedgången. Fridfull och tysta är omgivningar, bara fågelsången hörs från de höga träden och olivlundarna. Ett paradis som vi redan längtar tillbaka till. A 8 personnes (2 familles de 4 personnes), nous sommes partis découvrir la magnifique région de la Toscane. La propriété de Tommaso est parfaitement conçue pour accueillir 8 personnes grâce à ses espaces spacieux. Perchée en haut d'une colline on peut découvrir la magnifique campagne du Chianti. La terrasse est assez grande pour y prendre tous les repas. La table de ping pong, le billard et les vélos mis à disposition nous ont permis de passer de bons moments. Merci à Rita pour son bel accueil lors de notre arrivée ! Villa Andrei, heerlijk huis op een mooie locatie! Echte Toscaanse beleving! We hadden begin juli 2018 met 6 personen (6 volwassenen) Villa Andrei gehuurd. Villa Andrei is een heerlijk huis op een fantastische locatie. We hebben ervan genoten! Een mooi huis met de nodige voorzieningen, schitterend uitzicht, mooi landschap, afgelegen en rustig. Ruime villa, goede keuken met alle voorzieningen, 3 slaapkamers met extra slaapbank op 1e etage, ruime huiskamer met bar, 2 badkamers, authentieke pizzaoven buiten (erg leuk om pizza's te bakken), ruim perceel etc. etc. En niet onbelangrijk uiterst vriendelijke ontvangst door Rita, de beheerder van Villa Andrei. Rita is bijzonder hulpzaam en goed te bereiken. Ook leuk om te doen ... op de fiets naar het dorp ... biljarten en tafeltennis en ... uitrusten in de ligstoelen..... En tot slot ... uitstekend gelegen om Toscane te verkennen.... Florence, Siena , San Gimignano, Greve in Chianti, Pienza, Luca, Pisa, Montepulciano, genoeg mooie dorpjes en stadjes ... en niet te vergeten schitterend landschap! Veel plezier in Toscane! Ciao! Nous avons beaucoup apprécié la maison qui est spacieuse avec une vue magnifique. Nous nous sommes sentis immédiatement chez nous. La maison est mieux en réalité que sur le site car elle est très grande. Le petit déjeuner sur la terrasse avec une vue sur le Chianti est particulièrement appréciable. Il est facile de se rendre à Florence mais aussi à Pise, San Gimignano et Sienne. L'accueil a été parfait et une bonne bouteille de Chianti nous attendait. Le billard nous a permis de partager de bons moments. Merci pour ces belles vacances que nous n'oublierons jamais.